Reduced energy flow means that the amount of food available for predators -- such as fishes -- at the top of food webs is reduced, with potential consequences for fisheries species. Credit: Lance Anderson, Unsplash. 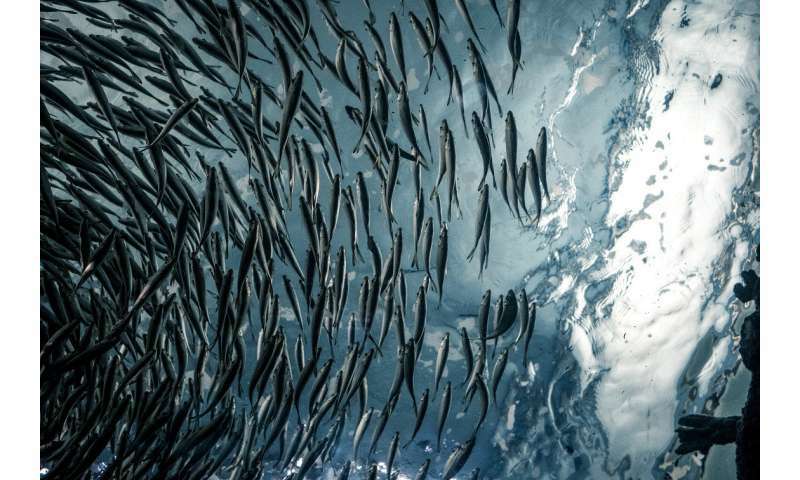 A new study has found that levels of commercial fish stocks could be harmed as rising sea temperatures affect their source of food. University of Adelaide scientists have demonstrated how climate change can drive the collapse of marine "food webs". Published in the open access journal PLOS Biology, the study's lead author PhD student, Hadayet Ullah and supervisors Professor Ivan Nagelkerken and Associate Professor Damien Fordham of the University's Environment Institute, show that increased temperatures reduce the vital flow of energy from the primary food producers at the bottom (e.g. algae), to intermediate consumers (herbivores), to predators at the top of marine food webs. Such disturbances in energy transfer can potentially lead to a decrease in food availability for top predators, which in turn, can lead to negative impacts for many marine species within these food webs. "Healthy food webs are important for maintenance of species diversity and provide a source of income and food for millions of people worldwide," said Mr Ullah. "Therefore, it is important to understand how climate change is altering marine food webs in the near future." Twelve large 1,600 litre tanks were constructed to mimic predicted conditions of elevated ocean temperature and acidity caused by increasing human greenhouse gas emissions. The tanks harboured a range of species including algae, shrimp, sponges, snails, and fishes. The mini-food web was maintained under future climate conditions for six months, during which time the researchers measured the survival, growth, biomass, and productivity of all animals and plants, and used these measurements in a sophisticated food web model. "Whilst climate change increased the productivity of plants, this was mainly due to an expansion of cyanobacteria (small blue-green algae)," said Mr Ullah. "This increased primary productivity does not support food webs, however, because these cyanobacteria are largely unpalatable and they are not consumed by herbivores." Understanding how ecosystems function under the effects of global warming is a challenge in ecological research. Most research on ocean warming involves simplified, short-term experiments based on only one or a few species. "If we are to adequately forecast the impacts of climate change on ocean food webs and fisheries productivity, we need more complex and realistic approaches, that provide more reliable data for sophisticated food web models," said project leader Professor Nagelkerken. Marine ecosystems are already experiencing major impacts from global warming, making it vital to better understand how these results can be extrapolated to ecosystems worldwide.